Ah, Spring, how I love you! the weather starts getting warm, we get a few thunderstorms – which I love! – the trees and grass turn green, flowers start blooming… and there’s pollen everywhere. That part, I don’t love. I doubt very many of us do. 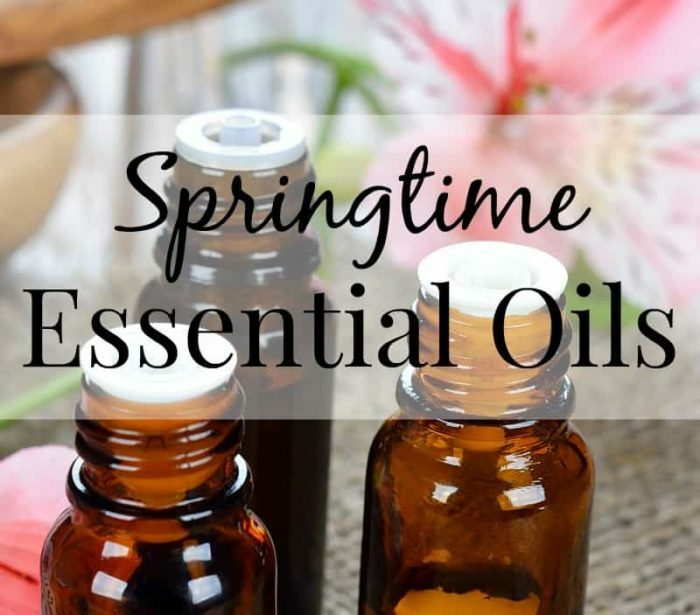 With that in mind, I have two main goals when I diffuse or apply essential oils in the spring: to smell like spring, and to support my family’s health against the effects of pollen (is that an FDA approved way to say that?). For skin application, probably the most famous, and easiest essential oil blend is Young Living’s Breathe Again roll on. Just roll it on your chest and/or neck, and you start to feel the effects on your air passages right away. But for the sake of this article, I’m going to be listing a bunch of essential oil singles, rather than blends, because a.) making your own concoctions is more fun, and b.) not everyone uses Young Living (although for my part, I’m firmly convince that they’re the best EO company out there!). Peppermint. This one has to be at the top of the list. It smells cheery and invigorating – just like a springtime oil should – and, well, we all know how wonderful peppermint is for sinuses and throats. I love to diffuse peppermint, as well as wear it in my diffuser necklace or bracelet. It can also be diluted with fractionated coconut oil, and applied to the chest and throat area. Lavender is called the “Swiss army knife” of oil for good reason, plus its relaxing floral scent makes it perfect for springtime. It’s one of my favorites to diffuse in the evening – sometimes with orange oil for added aroma happiness. I love using lavender oil in my homemade baby lotion. Lemon supports the lymphatic system, and helps the body deal with respiratory conditions. Plus, it’s a bright and happy scent, which in turn, makes me happy to use it! You’ll want to be careful about applying lemon oil to your skin before going out into the sun (citrus oils are photosensitive), but it’s also a great addition to your diffuser jewelry, and you home diffuser. LLP. I listed the three above oils first, because mixed together, they’re a powerhouse springtime blend, often referred to simply as “LLP”. We diffuse it so often this time of year, that for me, this is what springtime smells like. I highly recommend a blend of 5 drops lavender, 4 drops of lemon, and three drops of peppermint in your home diffuser, or diluted with a carrier oil in a roll on bottle. Simply roll it onto your chest and neck. Eucalyptus oil helps open up lungs and sinuses, which improves circulation and helps the body process pollen (and the other allergens), thereby reducing the symptoms. To use it, simply add to your diffuser jewelry, your home diffuser, or apply directly after diluting it with a carrier oil (are we seeing a theme here?). Eucalyptus sugar scrub is also a huge favorite of mine! Tea Tree oil is highly antiseptic, and kills the airborne pathogens that cause allergies. Ergo, diffusing it in your home = win. It can also be applied to the skin to kill microorganisms and bacteria. It’s a powerhouse oil! 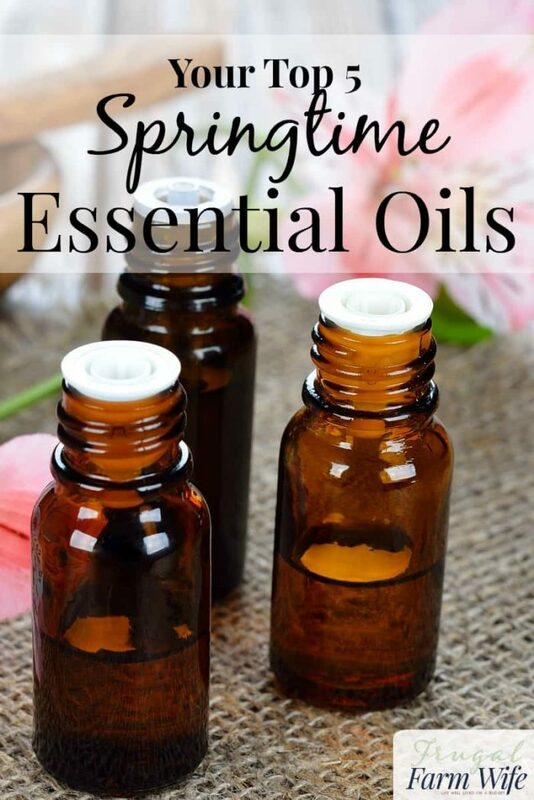 Being one of those people who has refused to take over the counter drugs for most of my conscious life, I really don’t know what I’d do without essential oils to help support my body against springtime discomforts. They are such a blessing! If you’ve never used Young Living essential oils, I encourage you to read more about them here, and then order a starter kit here (of course!). Nourish your body with ingredients you already have in your kitchen!